A happy family is obviously satisfied with its bounty at Masonville Orchards' Ault U-Pick orchard and country store. 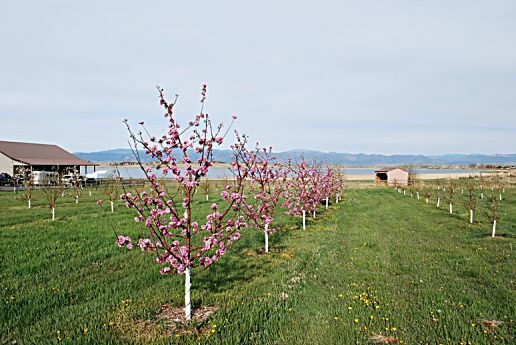 One of several Masonville Orchards locations, this one in Fort Collins, Colo., blooms, preparing for a prolific successful season. 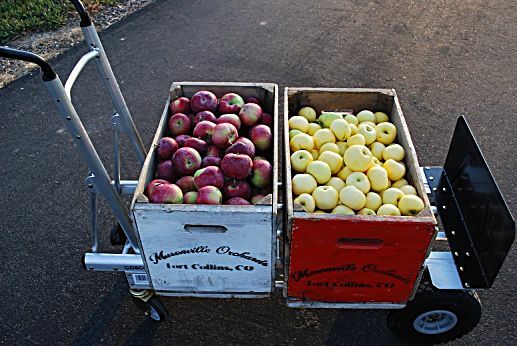 Masonville Orchards sell their apples at its U-Pick Ault location, to area restaurants, on its website and at Farmers' Markets. Owner Walt Rosenberg welcomes customers with open arms at one of several Farmers' Markets he attends. 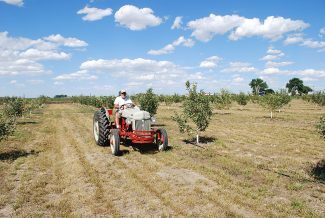 Walt Rosenberg maneuvers a tractor around his U-Pick facility in Ault, Colo. The orchard is one of several locations for Masonville Orchards. Johnny Appleseed would be proud; or maybe just a little bit jealous. You know, he's the guy who allegedly tromped across our vast country sowing seeds as he went. They purportedly sprouted into lovely trees that produced fruit as American as … apple pie. 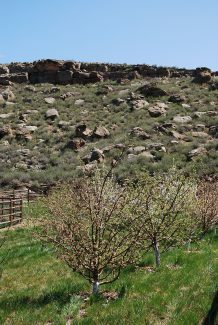 Walt Rosenberg, of Masonville, Colo., unintentionally bested Mr. Appleseed by planting pears and plums, as well as apples, in quite a few locations around northern Colorado. That geographic fact also came about somewhat by happenstance. Similar to that Appleseed fellow's famed trek through our nation, Rosenberg himself has seen quite a bit of territory from sea to shining sea. He grew up in Kentucky, attended college out West, and lived in Texas, Oregon and Washington before permanently settling in Masonville, where he purchased orchard land in 1998. For 20 years, Rosenberg has worked his modest acreage in the hills above Loveland/Fort Collins. But, approximately five years in, he decided to expand. Available land near Masonville was becoming quite dear so you could say the orchard owner decided to "branch out." Briggsdale captured his imagination when he learned he could purchase 750 acres there for about the same price as for just three acres in Masonville. So, in 2005, that's just what he did. 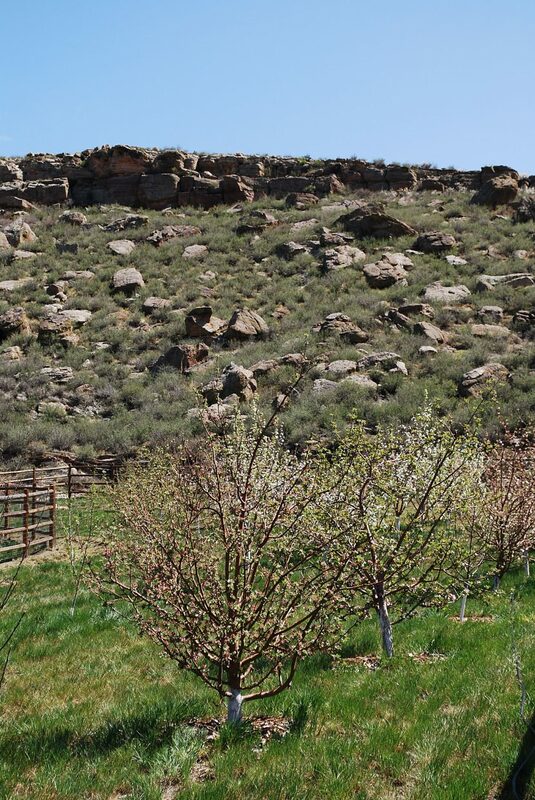 However, the land was initially lacking one important orchard feature: fruit trees. Stunned, Rosenberg kind of pictured his dreams withering on the vine. But he sure wasn't about to write off his new investment without mighty indisputable reasons. "Why not?" he questioned, awaiting some dreadful horticultural facts. "Because no one's doing it," came the hollow reply. Rosenberg couldn't believe his ears. In the several seconds before he could again speak, he realized this man knew absolutely nothing about fruit trees. So he then asked the guy, "Don't quite a few Briggsdale area farmers and ranchers have an apple tree or two on their property?" The answer was affirmative. "Well, then my 750 acres will just be more of the same," Rosenberg logically pointed out. But the foolishly firm fellow just kept insisting it wouldn't work only because no one had ever before planted an orchard there. But it did work. In fact, it worked so well that in the initial year's winter 'kill', not one tree was lost. 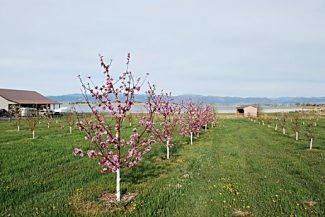 That early success prompted yet more expansion, first to Ault (a U-Pick orchard); then came locations at Stove Prairie and Berthoud. 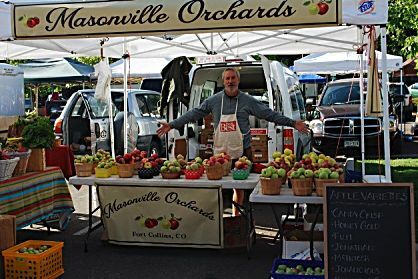 All locations do business under the name Masonville Orchards. Apples are its primary focus but, Rosenberg said, not the only one. 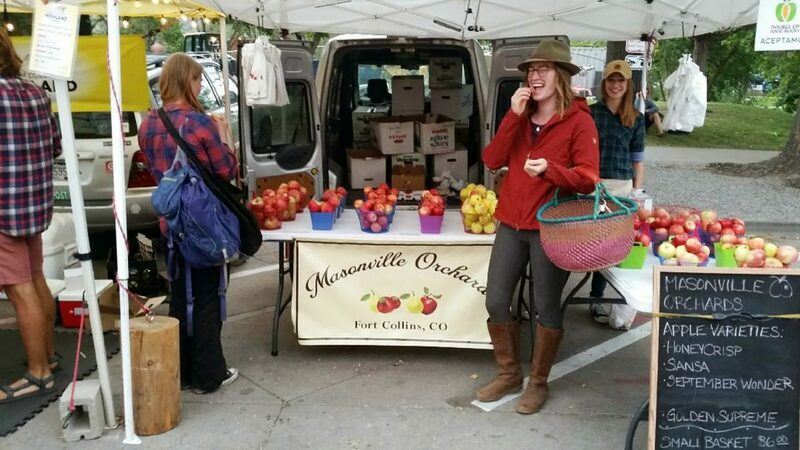 "We have over 200 different varieties of apples, pears and plums. 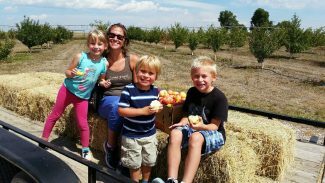 We sell our fruit via local farmers' markets throughout northern Colorado, through our website, at various local restaurants, and at our U-Pick Orchard in Ault, Colo. Each May, we provide a list of expected varieties, along with approximate ripening times, on the website's Fruit Varieties page. Ninety percent of what we grow, you'll never find in a store," he proudly proclaimed. "We bring diversity. You won't find our historical varieties in your average grocery store," Rosenberg added. Just some of the unique heirloom/historic apple varieties include Chenago Strawberry; Pristine; Wynoochie Early; Pixie Crunch; Cox Cherry Pippin; Ginger Gold; Macoun. Depending on variety, harvest is anywhere between early August to late September; the same for pears. 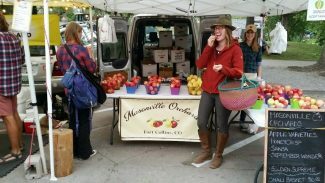 Another plus for customers is that Masonville Orchards' fruit comes directly from tree to consumer for fresh eating, juicing or processing. Rosenberg and a hired crew do all the harvesting. Because the fruit isn't first sent to a packing house for separation, it arrives in various sizes and shapes, just as you'd expect from an orchard. Fruit deemed not sellable goes into the Rosenberg's own refrigerator for eating or preserving; his horses, Mr. P and Nemo, share in the bounty of unsold product. "It's exceedingly challenging to have multiple locations," Rosenberg said. "We have to constantly move equipment and people around. But it's a risk-reduction strategy that minimizes losses from hail, frost and other weather conditions and events." 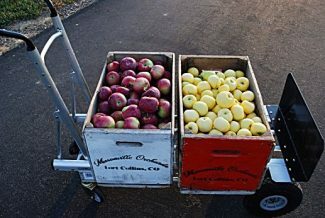 Masonville Orchards not only sells fruit, it also shares its wealth of otherwise difficult-to-find stock. Someone wanting to raise their own can choose from a wide selection already proven hardy in our area. "Selling scion is our big spring thing," Rosenberg said. "There's a list of available varieties listed on our website." Masonville Orchards is also proud of their excellent, lengthy working relationship with Haykin Family Cidery (hard cider) in Aurora. Be sure to follow the link to their page. Haykin's has some unique, superb products.